There’s a world of difference between the kinds of CCTV systems you find in retail stores and the professional kinds. You may have seen a selection of CCTV cameras at your local electronics shop and thought that they seem pretty affordable compared to the commercial surveillance options you’ve looked at. There’s a world of difference between consumer grade CCTV products and those intended for commercial uses, however, and despite there being thousands of options on the market, it’s important that you arm yourself with the knowledge to know what you need in your surveillance system. These are the kinds of systems you’ll find in retail and hardware store settings throughout the country. Their main selling point is affordability, as they’re meant typically for residential use which doesn’t require all the bells and whistles a commercial grade system may have. 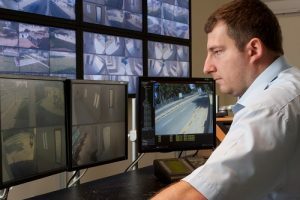 This can make them much more accessible to your everyday user, but that comes at a cost that could be detrimental to businesses or facilities with real CCTV needs. For example, they may be lacking in the necessary low light settings to illuminate those hard-to-see areas, or reliable wireless capabilities that a solid system of network-based CCTV cameras can offer. Commercial grade systems certainly aren’t fit for your everyday homeowner–their complexity would be complete overkill, offering features that would go unused and even make it more complicated to perform basic functions. Commercial systems come with larger storage capacity, more options for expanding the system, options like video badging, and the ability to have a central monitoring location so you can view all of your systems from one spot. They can provide valuable “analytics” that augment access control systems to create alarm situations and human recognition where humans aren’t supposed to be, for example. It may seem like you can get away with a cheaper system found at a retail store, but keep in mind that if your goal is to prevent shoplifting or be able to accurately identify someone, read license plates and even utilize thermal imaging, a commercial system will go a long way in helping you do so. The features that are incorporated into the design of commercial systems have huge benefits to any business or facility with real CCTV needs. This entry was posted on Friday, October 20th, 2017	at 5:26 pm	. You can follow any responses to this entry through the RSS 2.0 feed. Both comments and pings are currently closed.